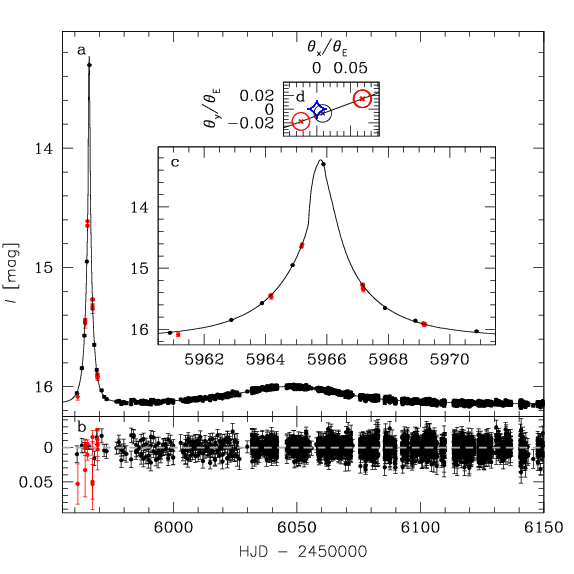 We present the discovery of a substellar companion to the primary host lens in the microlensing event MOA-2012-BLG-006/OGLE-2012-BLG-0022. The companion-to-host mass ratio is 0.016, corresponding to a companion mass of ~8 MJup(Mhost/0.5MSun). Thus, the companion is either a high-mass giant planet or a low-mass brown dwarf, depending on the mass of the primary Mhost. Figure above presents the light curve of the event (OGLE data - black, MOA data - red). Panel c shows zoom-in on the anomaly. Panel d shows the caustic (blue) approached by the source (black and red circles). The anomaly is well-separated from the peak of the primary event. Note that the anomaly magnification is larger than the host magnification, because magnification depends primarily on distance from the caustic, not the mass of the lensing body. 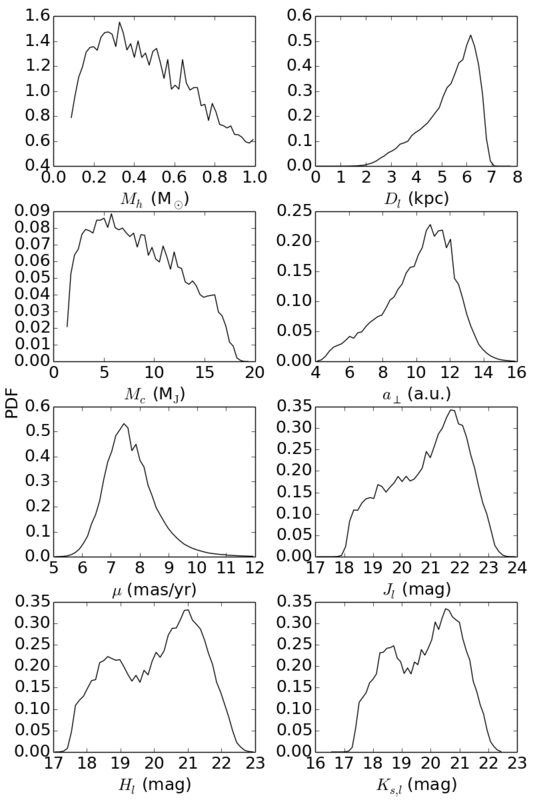 We infer projected separation of ~10 AU (Mhost/0.5MSun)1/2. Above we present the distribution of event parameters as derived from Galactic model: host mass, lens distance, companion mass, projected separation, relative proper motion, and predicted host brightness in three infrared bands. We have obtained adaptive optics images of the event using Keck telescope. The host flux is not detected, which is consistent with the above predictions. We also challenge a previous claim of a planetary companion to the lens star in microlensing event OGLE-2002-BLG-045. Any comments about the data and the form of their presentation are welcome as they can improve the future releases of catalogs of variable stars detected by the OGLE collaboration. Send your messages to this address.